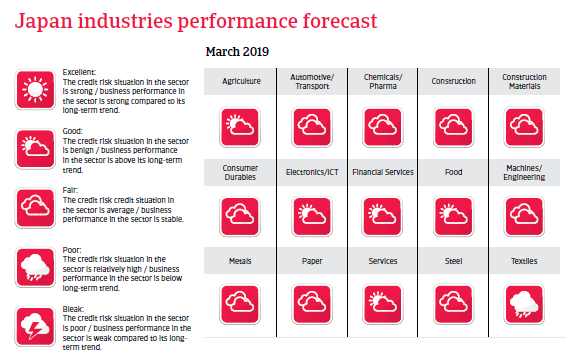 Japan´s export growth will slow down due to lower global trade expansion, but domestic demand will underpin the economic expansion of about 1% in 2019. 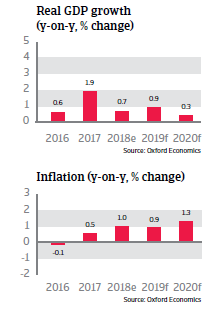 Japanese GDP growth slowed to below 1.0% in 2018, mainly due to a less accommodating external environment and the fading out of fiscal stimulus, while business investments kept up. In 2019 the economy is expected to expand at about the same rate. Export growth will slow down due to lower global trade expansion, less demand from China and the increased risk of protectionism. However, domestic demand is expected to underpin the economic expansion as unemployment is decreasing further and wages are rising. A consumption tax hike due in October 2019 will most probably weigh on spending, but the government has announced it will offset the effect with additional public expenses. Business investment continues to increase, driven by higher R&D spending for new technologies and the 2020 Olympics in Tokyo. Consumer prices are expected to remain far below the 2% target set by the government. Therefore, the Bank of Japan is expected to maintain its very loose monetary policy for the time being, with negative interest rates unchanged in 2019. Following a long period of loose fiscal policy, the Japanese government is struggling with extremely high public debt (about 225% of GDP in 2018). Japan relies mostly on domestic creditors to support its government debt (about 90% is held by Japanese investors), which makes the funding base less susceptible to capital flight. But maintaining such a high level of debt is costly, and further increasing government debt would at some point render it unsustainable. In addition to high government debt, the country faces demographic challenges: the population is shrinking and the working age population is also declining. Without appropriate measures, Japan will inevitably face a shrinking tax base and rising expenditures on retirement benefits. Many industries already face some difficulties due to labour shortages, leading to higher labour costs, which is hurting their international competitiveness. To achieve a sustainable rebound and to boost the country’s long-term economic performance, there is an urgent need to make the labour market more flexible, to end protection for farmers, doctors and pharmaceutical companies, and to introduce more business deregulation. The government has repeatedly announced its intention to tackle those issues in its current term, but major reforms are still vehemently opposed by powerful interest groups. Still it remains to be seen if and when deep structural reforms will be made. The sector shows good growth rates, but manufacturers active in the US are affected by the import tariffs on steel and aluminium imposed since June 2017. While many Japanese ICT businesses are highly indebted, companies obtain finance easily as banks are very willing to lend and interest rates are low. In 2018, respondents in Japan reported an increase in overdue B2B invoices and a longer time to convert B2B invoices into cash.